Brains Splattered on the Keyboard | Like Jackson Pollock. Not like The Godfather. Like Jackson Pollock. Not like The Godfather. It gets harder and harder, as the years go by, to shore up the rituals that shore up all of us. Thanksgiving is nice, but every year, something is missing, even from the enjoyable editions of that holiday. The electronic erosion of the Christmas season speeds up year by year; add climate change and the acceleration of time as we age, and it’s clear that you can’t go back to Bedford Falls. 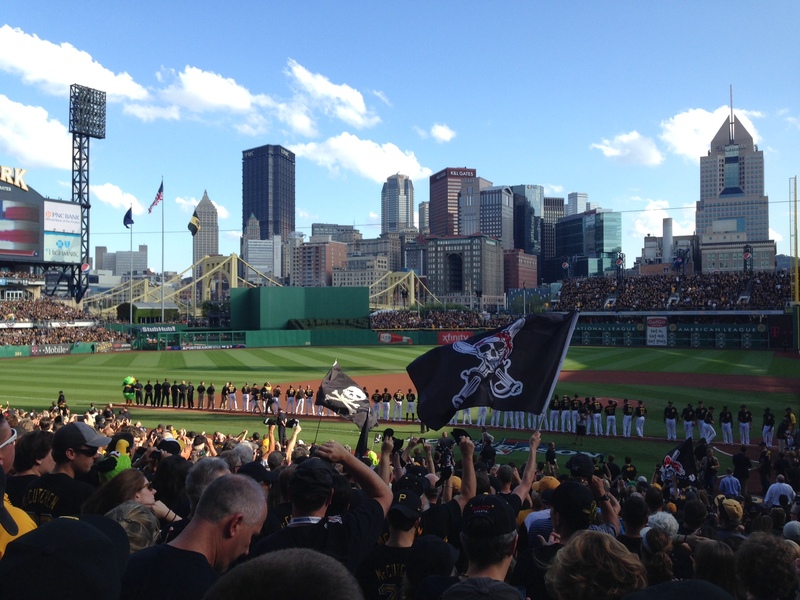 PNC Park, Pittsburgh. Got great seats in the There-In-Spirit section. Still, I get giddy on the opening day of every Major League Baseball season. I simply won’t let it decay. I have dug extra French drains and caulked around all the seams of memory. No amount of The Clean, The Clear, or pants worn down over the shoes will diminish today’s opener in my mind to a level below the ones I saw as a kid, when The Great Clemente himself loped out onto the field. I try to be quiet about it, but fact is, only attitude saves me here. It is the same annoying mindset that young, overzealous sales associates employ to turn car accidents and overflowing toilets into positives instead of the undeniable negatives they are. I am resolute in my determination to keep Opening Day sacred. Why? Because I deserve it, that’s why. Because its moment is so brief, and in the grand scheme so inconsequential, that it hurts no one for me to sit for a few minutes on a day in April (oh…it’s March…never mind) and draw a line backwards in my mind: McCutchen to Clemente to Mazeroski to Traynor to Wagner and back and back through dead-ball antiquity to the Civil War itself and rounders in England. Because Terence Mann was right, more prescient as a fictional character than legions of real people: They will most definitely come, Ray. For it’s money they have and peace they lack. Like the God-given aroma of a newborn baby, I cannot get enough grass-clipping-and-horsehide smell into my nose. Can’t be there this year, but I have an archive. Buck O’Neil, the great Kansas City Monarchs first baseman, said it best: You can’t kill it. Throw whatever you want at baseball, and somebody somewhere will be playing as soon as it gets warm. No need for opening new markets in Australia, no worries about salaries and Arizona stealing all the teams for spring training and A-Fraud. Just…the game. Thank goodness for The Show. An astute friend of ours is visiting, and over coffee, the conversation turned to the challenges of raising our respective 13-year-olds. Wonderful kids, they are, who give us very little real trouble. But like many kids their age, they are pulled from either end by ambitions toward adulthood and the comforts and habits of childhood. It’s hard to instill, the kind of organization that fosters discipline and would leave them more time to do the things they want, even when you argue convincingly that there will be more goof-off time if only they will put work before play a little more often. Reason alone is not enough with some people, especially young teens, especially when it emanates from the mouth of a parent. “I can come around the corner into his room,” I lament, “and he’ll be mid-video-game while there’s still science or social studies pending.” Our friend commiserates. My wife adds that even if the gaming interlude was a short jaunt away from work while looking up a legitimate homework question, this extra electronic time adds up. Sleep suffers, ours and his. It often comes back to the electronics, doesn’t it? My son doesn’t even have a Facebook page, yet he is active on Skype, gaming and chatting with his friends. He is a big looker-up of things on the way to looking up other things, a good sign of a smart kid. I don’t want to restrict access to his computer and iPad in a ham-handed way; I’d rather he slowly build a lasting discipline on his own. Parental pipe dream? Maybe. But taking the blinky things away completely has to be a last resort, to my way of thinking. Our friend has observed a more serious electronic wedge being driven into child life, though, this one by people who are beyond the disciplinary direction of others. She has seen parents like the one pictured, wheeling a stroller down the street and completely engrossed in the on-screen goings-on of their smartphones. The baby in the stroller is pretty much on her own. Take away any safety concerns (not watching for cars, etc.) and you still have serious cause for discomfort that perhaps only a mother would divine. Before handheld computers, a Mom walking her child in a stroller would likely be singing a little song, remarking how lovely a day it is, pointing and saying, “See that bird, honey? It’s blue!” In a word, engagement: the basis of language, observation, interest, a mental foothold on the world and the path to enlightened alertness. It’s also a special brand of love. I wouldn’t suggest that every moment in the presence of a baby needs to be filled with speech. (My wife and I still joke about a friend who had a baby about our son’s age. That little girl learned to talk way early because her mother had a habit of narrating her entire day like a sportscaster on caffeine. By the time she was 14 months, that kid had heard everything.) But the sound of a parent’s voice, the little facts, rhythms, and affections it conveys — these are the bricks and mortar of a well-grounded mind. The fact that parent and child enjoy such interactions makes them all the more precious. But silently locked into smartphone torpor? It doesn’t work. Of course, the baby doesn’t know enough to be as upset as I am at the thought, the image of a child waiting for interaction, but just sort of…left out there to drift. We all love the convenience and “neatness” of our smartphones, sure. No harm in that. But moderation in all things, right? Well…except in what’s good for our children. Days later, and like lead the knowledge sinks in. 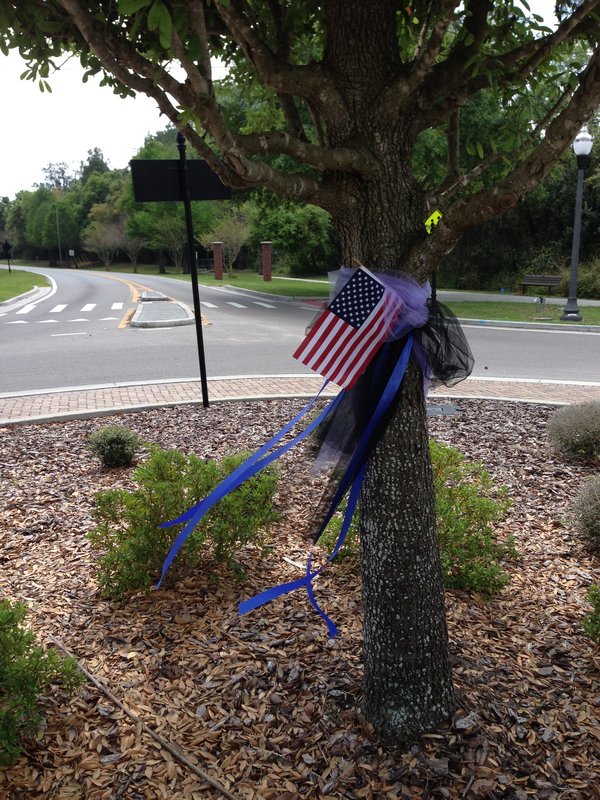 In our quiet little community, Windermere and nearby Ocoee and parts of west Orlando, the shooting death of a police officer echoes like a bell whose ringing makes you not only hear, but smell the rust, the decay, the imperfection of what looked perfect. Here, at this moment, a town gropes. It stares into space. It recriminates, even though it knows there is no point. Why did I take police for granted? Why have I ever felt so safe? What did we…do wrong? However misguided those kids were, they were…kids. Does not the volunteering to be on the front lines of safety deserve some…safety? Why? Why not? And what now? And so out comes…something. A gesture. 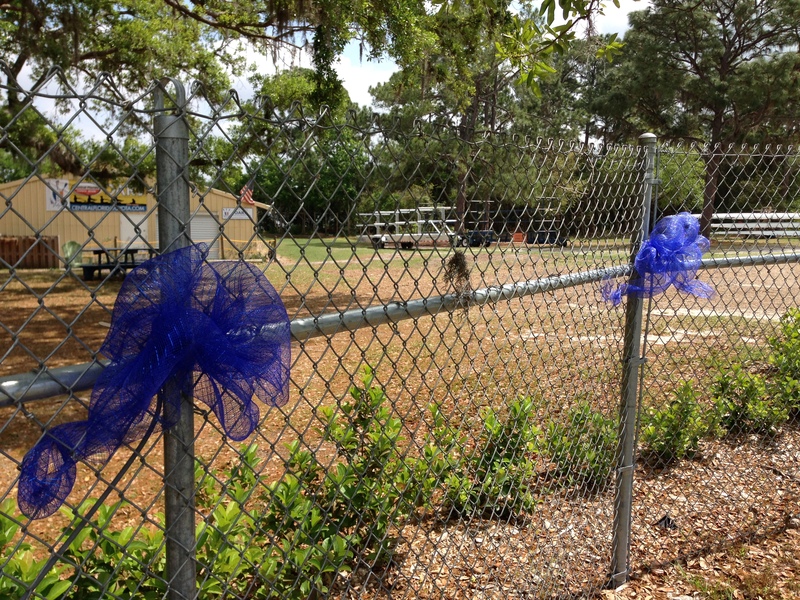 A town filled with violet ribbons on lampposts, signposts, mailboxes, boathouse fences. They waver in the wind under a sunny spring sky. A quiet acknowledgment. A tacit promise to do better. A hand held up in a pledge: I am here. I see. I saw. Thanks and Godspeed. We are safe, reasonably safe, because you risked this. I’ll admit it: “Support Our Troops” bumper stickers gall me. So do American flags on golf tournament flagsticks, attended by Marines in full dress. Not because serving and veteran military don’t deserve attention. They do. No, I find such displays annoying because most of the people who see them, and even some of the people who make them, will go no further than lip service. If you can find one in 10 people on the street who know we’re at war, and have been for years, you’re probably ahead of the average. If you can find one in 20 who understand the immense sacrifice, homelessness, mental health risks, job problems, and family strains modern military face, again you likely have beaten the statistical curve. Yes, there are many people who truly care for the plight of the military and help as best they can. But in many other cases,, Support Our Troops chic feels to me like businesses co-opting suffering to pump an extra buck out of people who want a quick I’m-deep endorphin hit. But believe it or not, there’s a class of public servant that gets even less sincere attention. 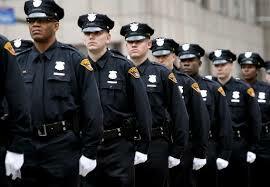 We take police for granted because we see them much more often than, say, a platoon of Army Rangers. We even suspect and fear police, especially in cities, because their more noble exploits (the majority) don’t sell as many papers or get high ratings. Give us a Rodney King situation, though, and we’re willing to pour mental acid on all cops. It was ever thus — no matter how few bad-apple police there may have been in the 1960s, when Chicago Police went nuts at the Democratic National Convention in 1968, the counterculture was happy to brand all police as pigs. I have met a few nasty cops. We all have. I have met many more who are courteous, patient, experts in human behavior, and truly dedicated to public service. How could you not have public service clearly in mind and still do this job? The donut-munching malingerer is a jokey stereotype that stopped being funny long ago. And while the risks soldiers take cannot be minimized, there is a substantial difference: the professional soldier generally enters a zone where he can expect an enemy and combat, and he is trained accordingly. The Kandahars and Tora Boras of the world are known danger zones, with all that goes with. But a professional peace officer, except in the worst zones of inner cities, moves through a world that is presumed to be calm and civilized. His or her job s to keep that peace, whatever hidden dangers might reveal themselves. And they do burst from cover in the most deadly ways. Our first indication, down at the boathouse Saturday morning, was unusually heavy traffic on the main road outside the fence, a quiet two-lane where smart drivers hew to the 30-mph limit in the little town of Windermere, Fla., because they know the local police policies. As people arrived late for their rowing workouts, we learned, bit by bit: a major intersection was closed, diverting traffic. It was full of evidence. In our quiet hamlet, a seeming bastion of safety full of comfortable homes and law-abiding folk, a teenage couple on foot had been stopped at about 4 a.m. by a lone police officer who inquired what they were doing out walking at that late hour. As far as anyone can yet puzzle out, one of the couple shot and killed the 31-year-old officer, then went across the street and murder-suicided themselves into oblivion. There is speculation that the couple may have just tried to rob a nearby pharmacy; details remain to be discovered. The news has, predictably, rocked the town and undermined the overarching sense of safety. It has also reminded people of the special risk of police work: that at any moment, in big cities or even small towns, its practitioners could be walking into the last moments of their lives in order to protect the many remaining moments of ours. Next time you hear of a routine police stop, remember: there’s no such thing. I get so excited when the UPS man comes. One of us is getting a package! Cool! But I also get sad. It’s just the UPS man. I mean, he’s working. He can’t stay. Is it my imagination, or did people used to…y’know, stop by and see people? Unscheduled? I know it’s not my imagination, because I distinctly remember being in the back seat of my Dad’s enormous Impala when he would say to my Mom, “Long as we’re in the neighborhood, let’s stop in and see Maishe.” And so we’d swing on over to Uncle Max’s, knock on the door, and spend a pleasant couple hours. My brothers and I would romp in the yard; the adults would chat over coffee and solve the world’s problems and figure the Steelworkers were asking too much this time and the Steelers, what are you gonna do with coaching like that, and no, haven’t seen Ernie for weeks. Wha? What happened? How? Did things speed up so much and get so informal that there was no time, plus too much chance of finding someone in their sweatpants? Did the collegial habit of visiting require some sort of Ward-and-June, creased-pleat perfection? I was disappointed. I still am. But the behavior is burned into my set of social rules. Even when I manage to overcome it and actually drop in on someone, I do so with trepidation. What to do? Well, for one thing, start again — but with a tacit social understanding: if the visitee says, “Lovely to see you, but could we do it another time? I’m just jammed up here changing the filler in the Diaper Genie and Jessica has a fever…”, then the visitor must cheerily understand and postpone. Why not? Shouldn’t every visit from friends and family be like a delightful Christmas gift? Aren’t our lives predictable enough? What brings a smile quicker than the approach of a friend you haven’t seen for awhile? It’s said that Winston Churchill, in his dotage, lamented to his personal physician that modernity had shrunk the world beyond recognition. The destruction of vast distances by fuel, speed, and determination removed a great deal of the mystery and romance from travel and imagination, Churchill said. Strictly speaking, he was right. And consider Winston’s point of view: as a former soldier and adventurer, he was exactly the kind of daring spirit designed to best profit from exuberant imperialism. And he did. But even Churchill would have been amazed at what technology enables us to do today — if only just visually. As much as we’d like to go to many places, time and expense cross too many destinations off the list. But — we can still see, and marvel. A friend put me onto a fascinating webcam, one of thousands in the world by now. 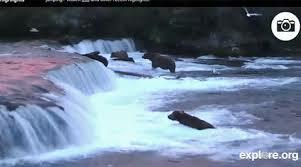 This one spies openly on brown bears at Brooks Falls in Katmai National Park in Alaska. At any given daylight moment, you can link up and see the ursine population of Katmai standing in the rushing stream below the falls, waiting for a hapless salmon to jump upstream. Occasionally, a bear snaps out of his lugubrious stupor long enough to grab a flying salmon and chow down. It’s a simple thing, and no different than the technology that enables us to see Edinburgh’s Royal Mile, a lakeside beach in Chicago, or puffins in a nest in northeastern Maine. Really happening, confirming imagination, putting edges and colors on things once only dreamed of. And why did Churchill and his peers work so hard to travel to these places and see these things, if not to get us to a world where we could bring these curiosities to everyone? It always surprises me — although, after nearly 24 years, less and less often — how little romance has to do with the real nuts and bolts of a marriage. Not that I’m an enemy of romance. Far from it. But the real structural steel and rebar that make a marriage strong are about as far from roses and poetry as…well, structural steel and rebar. I cannot identify a moment, way back in the late 1980s, when I decided that my wife was the woman for me. I do know there was a day when I could verbalize that idea in my mind, and as I said it to myself, I had the distinct feeling that I had known it for some time. Later on that mind-saying day, I happened to be at my parents’ house. “I’m going to marry Teresa,” I told them matter-of-factly, sort of as if I were saying, “I have a business trip to Toledo next week.” I promised to tell them how the proposal went, whenever I made up my mind to do it. Then I borrowed one of their cars and left. Not us. There is no stock photography of us. And I can guarantee you that in a minute, these two will be bickering. Some time in the weeks that followed, I shopped for a ring at a jeweler whose store was in a locally famous district for jewelry in Pittsburgh. After I made the deal, I passed a law school classmate as we crossed Liberty Avenue in opposite directions. “Only one thing it can mean when a young man is coming out of the Clark Building,” she chimed. I blushed in confirmation. It was the beginning of a long and lovely season of wedding planning and festivity. But none of the regalia of romance that followed in the next 18 months confirmed for me the wisdom of my choice. No, it was something much more momentous. My bride and I wallpapered a small bathroom together and emerged alive, still in love, and still married. Notice I did not say immediately happy with each other. One does not come out of such an experience beaming. Tight quarters (it was a downstairs powder room), literally back to back, a 45-year-old house built with a relaxed approach to straightness and squareness…that’s a formula for disaster. It took a special kind of calculus to match the pattern she had chosen, work it around the corners that were really cosine-crazy curves, and get the paste on the paper instead of ourselves. Calculus indeed — I can understand why Newton never married. I think we had been married less than a year when we tackled the wallpaper project — married, bought a townhouse, offered a new job, sold the townhouse, moved to Chicago, got into a temporary apartment, then another, found a house, bought it, started studying for the Illinois bar, got a job for me, and on and on. It was a test. It was marvelous and maddening to have each other, to learn each other, to soldier on and to hang on. I remember those early days with wonder and fondness. “What did we do on Saturday nights when we lived in Chicago?” I sometimes say as we have a glass of wine and watch the moon rise over our back yard. Sometimes I really don’t recall. “Well, we were downtown just about every other week,” she says. “Restaurants, bars. We loved the city.” And I remember. I don’t mind forgetting all that little stuff. I like being reminded, like I’m discovering it all again. The part I never forget, though, is the day-by-day strengthening of that structure. There have been trying times since, and a great many more joyful times, all romance of a kind laid over that solid structure. Today we drilled holes in cabinets and drawers to install new hardware. Templates. Measuring. Badly machined screws. A trip to Home Depot. Patience. Give. Take.